Forget the multi-dish platters, considered assortments or the requirement to share . . . sometimes all you want is a one-pot meal. Over hundreds of years, the Chinese have developed the art of noodle-making. Whether it’s thin al dente wonton noodles, thick and starchy ho fun or carefully hand-crafted dragon noodles, there seems to be a noodle for every mood and occasion. This dish is beautifully fragrant with five-spice and, considering the amount of flavour, healthy beyond belief. Surely nothing that tastes this good can be so healthy! Prepare, cook, devour – it’s that simple. 1. Heat the oil in a saucepan over a high heat. When hot, add the ginger, garlic, halved spring onions and the beef and fry until the meat is golden on all sides. 2. Add the star anise, five-spice powder, cinnamon and beef stock, and bring to a simmer. Add the Shaoxing rice wine, taste and season with salt and pepper if necessary. Simmer for 1–2 hours, until the meat is tender. Top up the liquid level with water if needed. 3. Once the beef is tender, strain the liquid into a clean pan. Discard the whole spices and the chunks of ginger and garlic and put the meat to one side. Heat the liquid through, adding the soy sauce, fish sauce and oyster sauce when the stock is hot. Taste and add more water if the flavour is too intense. 5. 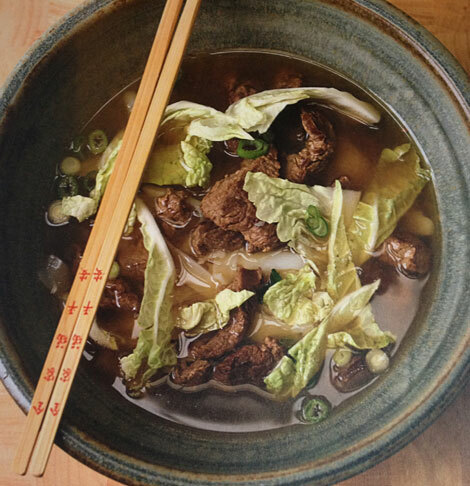 Divide the beef between the bowls and pour over the hot soup. Sprinkle over the sliced spring onions and serve.